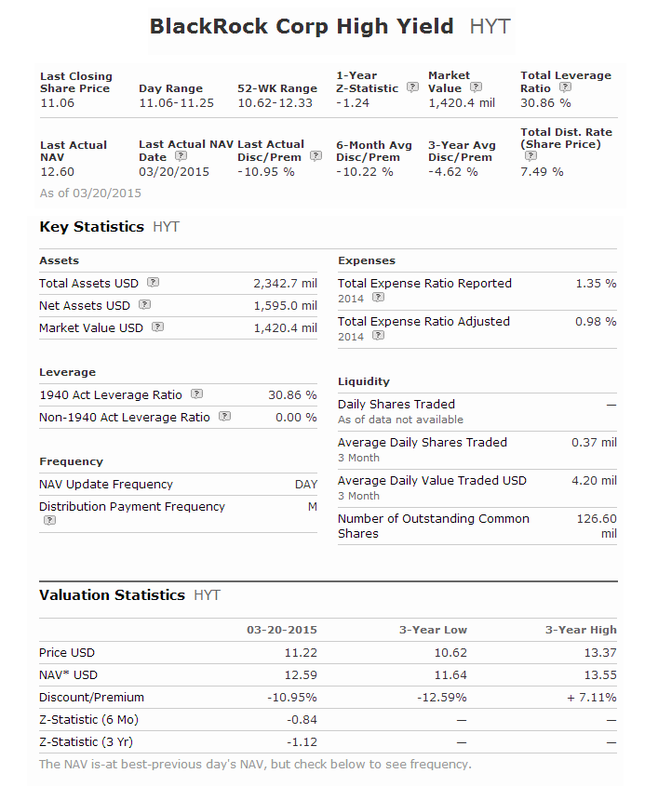 BlackRock Corp High Yield Fund (HYT) is a popular closed end fund. This fixed income fund invests mainly in below investment grade fixed income securities. These low quality debts are known as junk bonds. These funds may provide high yield for income. This bond fund is managed by Mitchel Garfin and James Keenan. The fund sponsor is Blackrock Advisors. Total net assets are $2.3 billion. The current expense fee is 1.32%. This bond fund has a high yield of 7.53%. This high yield bond fund can be buy through your brokerages. The fund has 859 holdings in its portfolio. Top 5 holdings are Ally Financial Inc, Amaya Gaming Group, Inc., American Capital Ltd, Ally Finl 8% 8.00 01 Nov 2031, and Goodyear Tire & Rubber. Top 4 sectors are corporate debt, floating rate corporation debt, general equity, and preferred shares. This BlackRock Corporate High Yield fund has a high yield for income. It ranked very high by Morningstar. Expense fee is a bit higher than ETF.